Pakistani youth has been slowly stepping up to the international stage in proving a name for themselves and the nation. New and young faces have emerged from the land in different areas of life to show that Pakistani youth is as talented and capable as any other. More and more child artists are making their way into the industry as early as possible due to more involvement of and connectivity of people through social media. This talent is not limited to acting or singing but to gaming, education, entrepreneurship and sports as well. With a fast and working social media and more and more talent hunters coming into the market, it is no surprise that Pakistani youth has started making an impact on the world. Mawra Hocane is someone who stands out in this line of youth. She has made her mark not only in Pakistan but in the neighboring country and arch rival India as well. She has worked hard to prove her mantle in the industry and create a name for herself. This has led to an immense rise in popularity and an even higher following on social media. Not only has she appeared in various television drama serials which have been well received by the audience, she has also made a name for herself through her modeling. She, along with her sister have walked the ramp for numerous famous Pakistani designers. Because of her good looks, dedication, passion and sincerity for her work she is now considered to be a leading model and actress in the industry. There are many old, new, emerging actors, actress and models that not only envy but also wish to be in Mawra’s shoes as has she managed to attract the audience and fame in very little time. Mawra Hocane is currently a TV actress in Pakistan. She was born on 28th of September 1992 in Karachi. By zodiac sign she is a Libra. 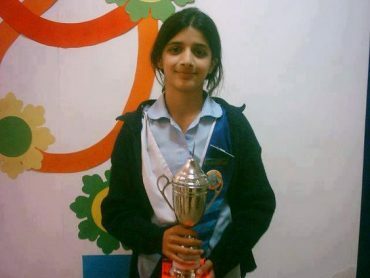 Her original name was Mawra Hussain but she changed the spelling of her surname in the 7th grade to make it unique. She did her schooling from Bahria School in Islamabad, the capital of the country. She pursued law and holds a Bachelors of Law or LL.B. She went to The Institute of Legal Studies in Islamabad and later joined Pakistan Institute of Fashion and Design in Lahore to pursue fashion designing. Her father’s name is Mushtaq Hussain and he served the Pakistan Army. She has a sister named Urwa Hocane who is also a notable member of the Pakistani media being a model, actress, VJ and now also a singer for the love of her rockstar husband Farhan Saeed who is a mesmerizing singer of the Pakistan Music Industry. She also has a younger brother named Ins E Yazadan who has also given a kick start to his acting career by appearing in Hum Television’s famous drama serial Udaari. Before entering the television world, Hocane started to perform as a theatre artist in local theatre groups. Her stint as a theatre artist didn’t last long, but reportedly gave her necessary acting skills and inspired her to pursue a career in the entertainment industry. After performing as a theater artist she started working as a VJ for ARY Musik. Mawra Hocane gained popularity when she made her debut in the Pakistani television serial drama Maryam which aired in 2009. Since then she has been casted in numerous hit serials like Aahista Aahista, Ik Tamanna Lahasil Si and Nikhar Gaye Gulab Sare. 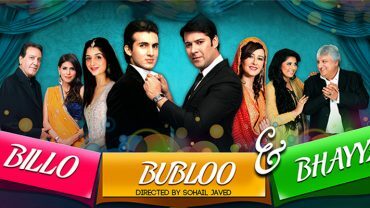 Within a short span of time, Mawra Hocane had made a mark on the screen with the audience and directors as well. Her impressive acting skills combined with her innocent face and good looks make her an ideal actress for most roles. She has been on the rise since the beginning and her acting skills have only improved overtime. She made her Bollywood debut in the Sanam Teri Kasam alongside Harshvardhane Rane.Sanam Teri Kasam was released in 2016 and is an Indian romance film.During the shooting of the film though, Mawra got severely injured in the hands and foot due to an accident. The film was an average grosser making just $1.3 million in the first week. Mawra Hocane has signed two other Bollywood films as well which hopefully will result in another career milestone for her and certainly delight all her Mawrillicios fans. 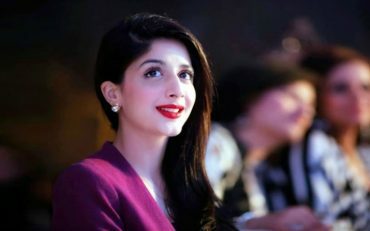 In September 2014, many tabloids in Pakistan reported that Mawra Hocane’s boyfriend was Aamish Azhar as the two were seen many times together in public. 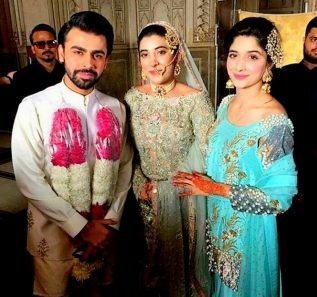 At one point, Hocane, in fact, changed her relationship status from single to engaged. However, by 2015, her relationship status was back to single. 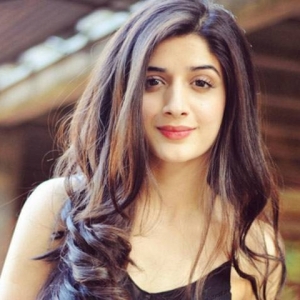 Mawra Hocane has remained active on the social media Instagram since the beginning. She is constantly updating her social media, making it her travel diary and uploading photos almost every day about her daily routine. She also posts pictures of her travels where she includes pictures of famous landmarks along with anyone who has travelled with her. She is also very active on famous social media Twitter where she voices concerns against matters of the society. Mawra Hocane has been known to be vocal and expressive about her thoughts and opinions and has made sure that she is heard. 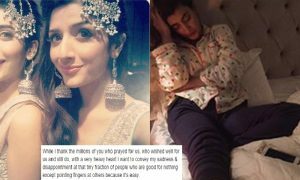 Most Lately, she screamed her heart out when the Hocane family was struck by the social media audience over the extravaganza wedding event of her sister Urwa Hocane with Farhan Saeed that happened in 2016 on the 18th of December. 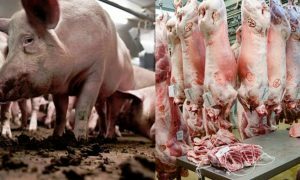 She expressed deep disappointment towards the people who constantly kept humiliating the family with degrading comments over the family which indeed was a much needed response. 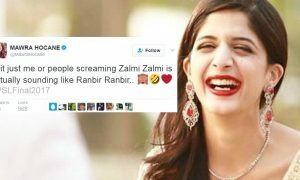 One such expression of her opinion led to her ridicule on the social media by the Pakistani fans. The hit film Phantom, which features a group of Indian operatives hunting down a Hafiz Saeed-like terrorist after the Mumbai attacks, had sparked angry exchanges on social media among Pakistanis who were divided on the movie. The film was banned by the Pakistani censor board due to its Pakistan-bashing theme. Veteran Pakistani actor Shaan Shahid, who has acted in several films with patriotic themes, launched an online campaign to ban actor and model Mawra Hocane after she tweeted in favor of the movie. Mawra Hocane had once stated that her favorite actor in Hollywood is Brad Pitt, and Salman Khan in Bollywood. But she has made it very clear that the person she is obsessed with in Bollywood is none other than the ladies-man himself, Ranbir Kapoor. She has expressed it many times and stated on numerous occasions that she would love to meet him someday. She had also stated that Cristiano Ronaldo is extremely hot. In a video made by Ranbir Kapoor, he actually extended a hug to the Pakistani fans and took Mawra’s name in it, realizing her obsession for him. A fun fact also remains that Mawra shares her birthday with her all time crush and super star Ranbir Kapoor which happens to be 28th September. Even though Pakistani dramas have gained popularity around the world, there are little recognition awards for those who act in them. Recently HUM television network started a trend to award those on their performances in their respective categories. Mawra won the Best Debutant Actress award for the year 2014. With her exceptional dancing performances, Mawra has also set the stage of various awards shows on fire and have won hearts and cheers of the audience on and off the screen. What she always carries: My phone, my bag and my perfume. Her personality: I am a cry baby. A lot of people don’t know this. I can cry on almost everything. Her favorite person: I love my sister the most. She is the best part of my life. Smartest people for her: Cristiano Ronaldo is super-hot. Then there is Ranbir Kapoor, I think he is very smart and Harsh, my smartest hero. Biggest indulgence: I can eat a full chocolate fudge cake. Also, getting my nails done can make me happy. About fear: I don’t think there is anything in the world that I cannot face. Wish list: I want to win all the awards and I am working hard for it. Favorite compliment: The most overwhelming compliment is that Harsh keeps on calling me a princess. I think it’s the best. Favorite show: I can binge-watch Bigg Boss. I think its super cool. First date: My first date was very cute when in school we believed that if we go with all our friends, it would be a decent date. So, my first date was me going with four of my friends and him coming with three friends. Along with above mentioned characters, Mawra Hocane have made significant appearances in many other serials, videos, shows and sitcoms which include; Country Love, Kitni Girhein Baaqi Hain, Love Ke Chucker Mei, Ghar Aaye Mehmaan, Papa Raazi, Meri Wife Ke Liye, Billo Bablu Aur Bhaiyya, Shareek e Hayat, Khichri Salsa and Shadi Mubarak. These were aired by different national television channels of Pakistan. Mawra Hocane, in a very tender age has proved herself as one dynamic and versatile actress of not just the Pakistani Entertainment Industry but have also justified her talent phenomenally on the other side of the border which in itself was a courageous step in her acting career. Her role as Saru in Bollywood movie “Sanam Teri Kasam” went justifiably awesome with her looks and appearance. Despite all the objections marked by the Pakistani audience over her revealing attire in some of the scenes and a few bold and loud acts, she bravely continued playing her role in the movie and with absolute courage faced all the demurrals. 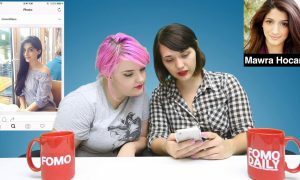 This Is How Americans Reacted To Seeing Pakistani Actresses For The First Time! 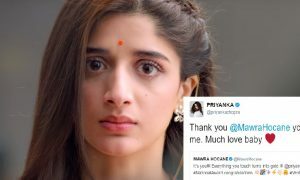 Mending Ties – Mawra Hocane Continues Interacting With Indian Celebs And Their Replies Show Positivity! 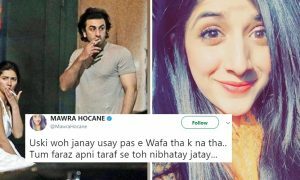 Mawra Hocane Was Trolled By Pakistanis For Posting This Hilarious Tweet Last Night! 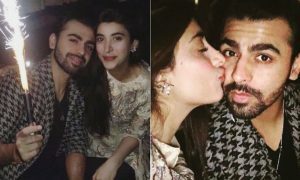 Urwa Hocane Threw an Amazing Birthday Party for Husband Farhan Saeed in London and OMG!